An astonishing fantasy course opening next year in China will bring the whimsy of miniature golf to the real game. 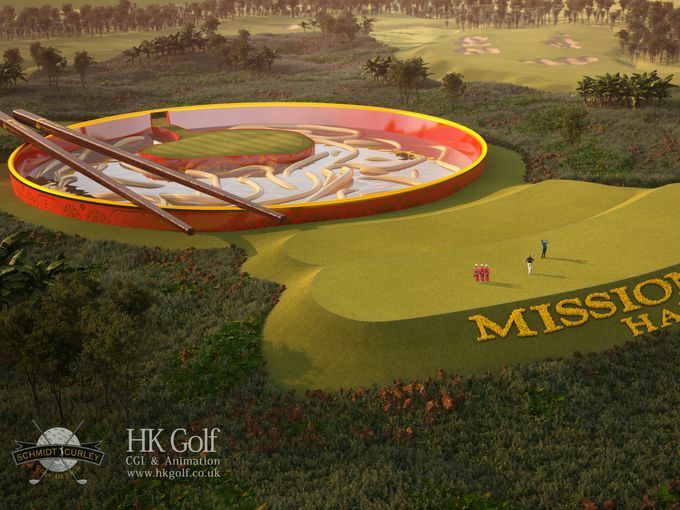 Players on the Mission Hill Fantasy Course will have to hit shots into winds from massive fans, over terra cotta warriors and through a waterfall. There are holes dedicated to pandas, fairways that include Mayan ruins and — the showstopper — a green that’s set in a massive bowl of noodles. It’s all real. Players will use real clubs on real turf with true greens. The course will be part of China’s top golfing resort, which boasts 12 other courses, including the top-rated track in the country. Here’s a sneak peek at three of the holes. Hit from tee boxes that are designed like Mayan stepped pyramids. The fairway is littered with replicas of Mayan ruins. — The green is a relative disappointment. Based on the pictures and video clips, it looks shockingly normal. No blood-letting or human sacrifice if you don’t hit it in regulation? — That hole is going to be terrible to play when it’s carth path only. — It costs $65 to play my local muni course and that place can’t even build adequate wooden containers for water jugs. 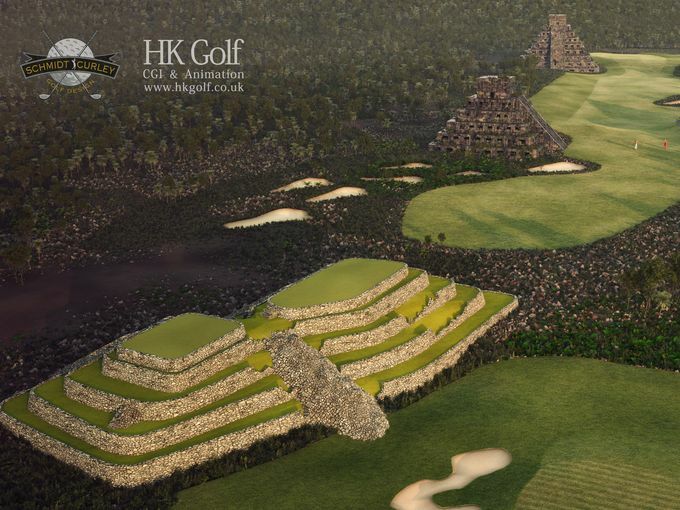 Based on the amount of Mayan architecture on this hole and the amount of upkeep it will require, I’m guessing greens fees at the fantasy course will run approximately $2.7 million. A model of the Great Wall of China runs along the left side and in back of the hole. 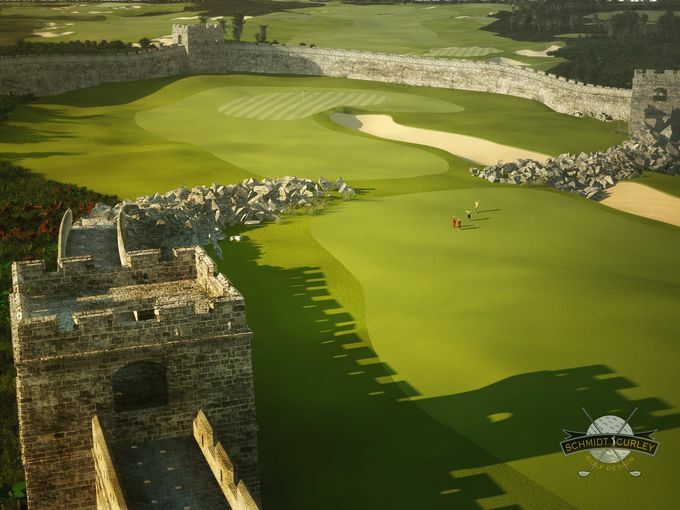 — How tempting would it be to try and hit a stinger onto the walkway of the Great Wall and then have your ball bounce all the way down to the green? The green is at the center of an 85-meter wide bowl of noodles, complete with 70-meter long chopstocks dangling on the side. Course architect Brian Curley says the green is the same size as the famous one at Sawgrass. — Want to visualize the hole? Imagine you’re in the 1988 film Honey I Shrunk the Kids and you’re hitting into a green that’s in the middle of a Cup O’ Noodles. — Is the water boiling? Jean Van De Velde needs to know. Are the noodles edible? John Daly probably wants to know. — The fantasy course sounds great, but if you’re going that far, at least give a nod to irony and make it so players have to putt into the mouth of a real-life clown on the 18th green.